We are honored to announce Made Especially for You by Willie Kay has received a "2017 Award of Merit" from the American Association for State and Local History! For almost six decades, Willie Otey Kay transformed dreams into dresses for generations of Tar Heel brides, debutantes and partygoers. The esteemed Raleigh designer overcame hardship and transcended racial boundaries to create a successful business. Discover the woman behind the fashion in the exhibit Made Especially for You by Willie Kay. The free exhibit will run through September 5, 2016. 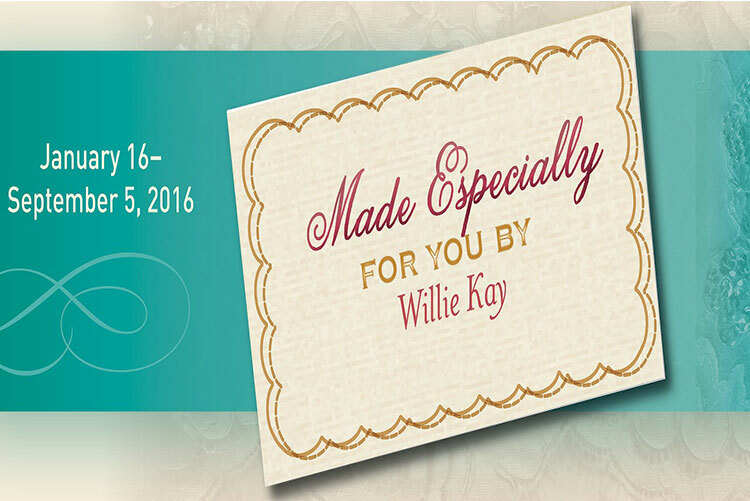 Made Especially for You by Willie Kay will showcase 10 of her exquisite creations that include wedding gowns, formal dresses and a debutante gown. In addition to the exhibit, a short-term bonus display of even more dresses, generously loaned by individuals from Raleigh and surrounding communities, will take place from Aug. 22 through Sept. 5. Without using commercial patterns, Kay crafted one-of-a-kind dresses for the women who commissioned them. She was in such demand that even prominent socialites worked around her schedule. “A Willie Kay original was a treasure indeed and well worth the wait,” notes Diana Bell-Kite, Exhibit Curator. Exhibit visitors will learn that Kay’s life wasn’t always as smooth as the satin and silks surrounding her. The African American entrepreneur achieved widespread acclaim in the face of segregation and personal loss. Born in 1894, Kay grew up in a large, loving family in Raleigh, where her father, Henry Otey, owned a barbershop. She graduated with a degree in home economics from Shaw University in 1912. There, Willie met medical student John Walcott Kay. The couple married in 1915 and moved to Wilmington, where he practiced medicine. Sadly, John died suddenly in 1927 at age 37, leaving a brokenhearted wife and five children. Willie Kay and her children returned to her parents’ Raleigh home, where she started dressmaking as a means of support. Her sisters also were talented textile artists, and they helped her during busy periods. Mildred Otey Taylor and Chloe Otey Jervay Laws ran their own dressmaking businesses, and Elizabeth Otey Constant embellished the formal gowns with intricate beadwork. Kay’s clientele grew to include governors’ wives and a who’s who of North Carolina society — black and white. Each year she made an equal number of dresses for the Alpha Kappa Alpha Ball (predominantly African American) and the North Carolina Debutante Ball (predominantly white). Kay’s renown spread beyond North Carolina’s borders, and her work was featured in national publications. Even as her status grew, the designer maintained her signature humility and charged only what she considered fair. Come see her beautiful work in Made Especially for You by Willie Kay. A sampling of exhibit items follows. A wedding gown with matching veil. Carolyn Dorcas Maynor drew her own design for a satin gown with a 10-foot train. She brought the sketch to Willie Kay, who created the gown of Maynor’s dreams. The dress is embellished with glass and pearlized seed beads. Second-night gown, satin adorned with sequins and rhinestones. Debutantes often needed formal attire for events other than the ball, and Louise Wooten donned the teal gown in 1954. Evening gown with matching overbodice, cotton velveteen enhanced with rhinestones, sequins and bugle beads. Kay made the red sheath dress for her daughter June Kay Campbell to wear to her granddaughter Mildred Campbell’s debut at the Alpha Kappa Alpha Ball in Raleigh in 1964. Mother-of-the-groom dress with matching clutch. Satin brocade with handcrafted cabbage roses. Doris Dosher wore the rose-colored dress to her son’s 1959 wedding at Raleigh’s First Baptist Church. A baptismal ensemble, satin and cotton, embellished with cotton insertion lace, hand-tatted cotton lace, chiffon, and satin ribbon. Kay made the gown, matching coat and bonnet for the 1947 christening of her grandson, Ralph Campbell Jr.
Kay used the proceeds of her business to send all her children to college and to strengthen Raleigh’s African American community. She contributed to local universities, St. Ambrose Episcopal Church, and other civic and educational organizations. The designer sewed well into her 90s and died in 1992 at age 98. Made Especially for You by Willie Kay features an interactive component with oral histories from 10 people who knew the Raleigh designer and her sisters. Come step into a world of satin and sequins at the N.C. Museum of History.